As the authors point out, there is also the possibility that fans of Death Metal have become somewhat desensitized to the inherently aggressive nature of growling vocalizations, allowing them to pay more attention to lyrics. 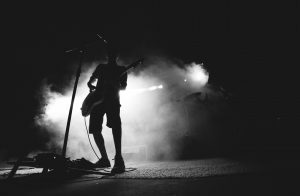 Death Metal fans also have a very different experience than non-fans when listening to this music, using it to discharge negative feelings, increase energy levels, and generate powerful and positive emotional states such as joy, empowerment, and peace. For more information, please review the publication ‘Who enjoys listening to violent music and why?’.